SoapCalc is truly a soap makers best internet friend. It's a great tool for formulating your own recipes, checking recipes you've found elsewhere and converting a recipe to make larger (or smaller) batch. 1. Plug in the weights of the oils (fats and/or butters) of the current recipe into the oz., lbs. or grams column (located under section 8 of SoapCalc). 2. Enter the superfat (in section 4) if it's listed. If it's not, you can keep it in the default of 5% or increase it. Also enter the amount of fragrance used. 3. If the recipe has a water reduction and shows the percentage of water to oils, the lye concentration or lye ratio, you can change it in Section 3. Otherwise leave it at 38%. 4. 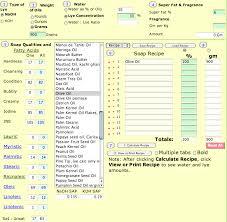 Hit 'Calculate Recipe' and SoapCalc will show you the percentages of the oils. 5. Now go to section 2 (Weight of Oils) and tell SoapCalc how the weight of oils you want to use. Keep in mind it's only the weight of the oils, not all the ingredients—you won't see the total weight until after you hit 'View/Print Recipe.' You'll have to jiggle around with the oil weights if, for example you want exactly 48 oz. of soap.